I am proud to be part of the third generation of Parmeters working in our family business. I grew up in the business and was a builder on log home job sites. Today, I work directly with our customers, as a sales advisor, to design their perfect home. My dad and uncle Jay encouraged me to learn every part of the business - just as they had done. I spent years as a materials estimator (calculating the quantities and cost of materials for our homes), followed by time in our Purchasing, Production, Shipping & Receiving, and Customer Service departments. I now focus my full attention on doing what I love the most - providing an exceptional home buying experience for our customers. Outside of the family business, I like exploring the outdoors, kayaking, snowshoeing, flying, working out at my local Crossfit gym, and having a craft brew with my friends and family. I love what I do and I look forward to helping you fulfill your dream of living in a Golden Eagle log or timber home. Call me when you're ready and I will guide you through this amazing experience. "After looking for a log home company for approximately twelve to eighteen months, we finally found Golden Eagle Log and Timber Homes, located in Wisconsin Rapids, WI. Prior to this time, over the course of a year, we systematically researched and actively interviewed many companies interested in assisting us build our retirement home in the North Georgia Mountains; however, these companies fell short of our personal expectations. When we finally walked into Golden Eagle and met personally with Zach Parmeter, we knew we finally found a critical member of our building team, even though there were many miles separating our actual project/build site and Golden Eagles' home office, and we feel the same today. We immediately felt the strong family presence in this American owned multigenerational company. Zach has been and continues to be available and extremely competent to address any question we may have. Zach looked at our preliminary plans and worked with our draft design to sculpt a stunning architectural plan that would fit both our personal needs and fall within our operating budget. Not only does Golden Eagle provide excellent customer service but they also provide and deliver beautiful log products and other related products such as doors, sinks, showers, kitchen cabinetry, decorative beams, windows, roofing, stain, etc. Zach has always been plugged into every step of the overall process from design to the getting the materials delivered on time and on budget. Our experience thus far with Golden Eagle has truly surpassed every expectation that we had. Part of the beauty of Golden Eagle, and Zach in particular, is that they are truly professionals and always treat us as if we are part of the Golden Eagle family. Zach and the rest of the Golden Eagle team demonstrate the honor, integrity and phenomenal service any customer would expect." "Diane and I would like to thank you and Golden Eagle for your help, insight, and cooperation thus far in our log home project. We have just about finished the sight work and are extremely excited to have the logs delivered in a couple weeks. Working with you through the planning and selection process was a pleasure and we look forward to continuing our relationship as the project moves forward." "You've always treated our home as if it was your own, and we are grateful for that." "We are so excited have spent our fist Christmas in our home and we could not be happier with how well everything went. We can't say more than enough about how much Zach helped us get an incredible home. 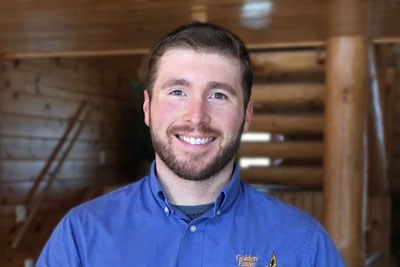 We didn't know anything about log homes when we started, yet we were always well-prepared thanks to Zach's creative solutions, communication, and organization. You've treated us like family and it means a lot. Thank you!" "I appreciate the great work done by Zach and the crew at Golden Eagle! We wanted to get into our home as soon as possible, and you all made it happen. Golden Eagle is a very well-run company and I'm a little surprised how smoothly everything went. Zach helped us make a lot of decisions and he made sure we didn't miss any opportunities to improve our home." "After waiting what feels like forever to save up enough money, we are just thrilled to be in our rustic cabin. Our cabin is always open to you. Thank you for a great experience and a dream come true! It is more beautiful than we imagine." "We want you to know that from the first day we met with you, we felt confident that we were with the right guy backed up by the right team. Your ongoing service and support has been excellent! As a sales manager, I can appreciate your professional documentation and clear expectations that you set. Your follow through and accuracy were consistent and timely.